Here’s a clever idea for a container garden: an old shopping cart. 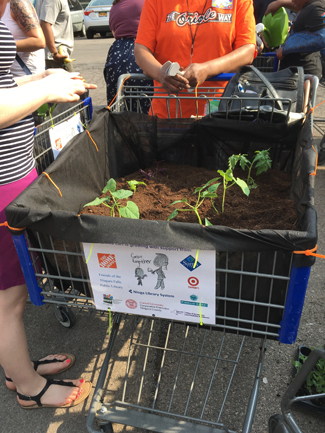 It’s part of Grow on the Go, a mobile garden project through Cornell Cooperative Extension based in Niagara Falls. The idea is to help Niagara Falls residents grow fruits and vegetables in an urban environment where they may be living in an apartment with no greenspace. They may lack sunlight and gardening equipment, and they may not know how to garden. Using shopping carts allows the garden to be wheeled into buildings, onto elevators and into apartments for safekeeping. If sunlight in an apartment is an issue, the cart owner can take their garden outside during the day to give the garden the sunlight it needs to grow. 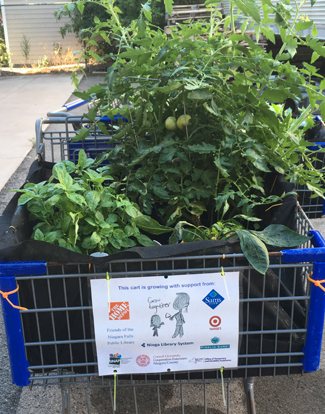 Grow on the Go is based off the North Coast Food Web mobile gardens concept, using abandoned shopping carts as gardens. The shopping carts are filled with weed block liner, soil and plants. The participants in the program are excited that they could make chicken fajitas with the peppers they grew and have cucumbers in their salad, said Justine Hays, lead nutritionist with Cornell Cooperative Extension of Niagara County. They have an eggplant that is ready to be picked, tomatoes that are starting to turn red and lots of basil and kale and other produce. “It’s exciting when you hope something is going to work well and it actually does work really well,” Hays said. Twice-monthly Cart Clinics on nutrition and gardening are held at the Niagara Falls Public Library, 1425 Main St., Niagara Falls. The clinics are free and are open to the public as well as to participants in Grow on the Go. Great idea…but you cannot promote removing shopping carts from stores that purchased them to make them your own…those stores purchased those carts, and to take them is to steal them. Please remind people that they can be purchased for less than $100 online…but do not encourage theft. Thanks for all the great tips! Stephanie, that’s a good point. We don’t want people to think they should steal shopping carts from stores! This program was able to get old shopping carts. I thought that the average gardener may not have access to old shopping carts, so I’m glad to know that you can find them online. What a great tip! And this article might give someone an idea on how to reuse something they do have on hand. Perhaps they have an old wagon or wheelbarrow that doesn’t move as well as it should. It could be repurposed as a garden that moves well enough that you could relocate from one part of your yard to another to keep the plants in the sun. Thanks for your help!